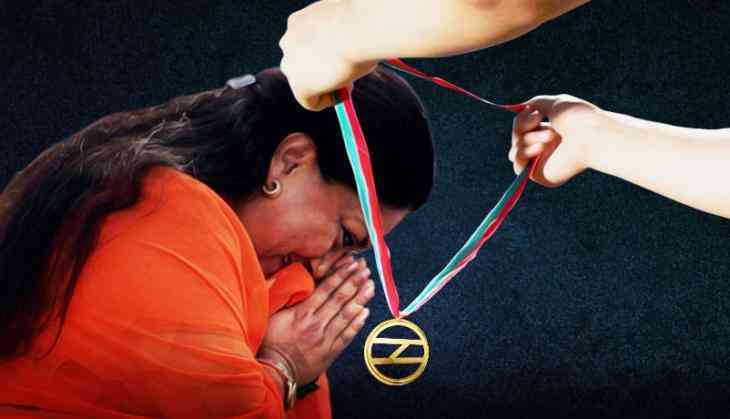 No matter how much she may detest it, this is one award Rajasthan Chief Minister Vasundhara Raje can't return. The Jaipur Metro has been honoured for being the 'Best Urban Mass Transit Project' in the country by the Union Urban Development ministry. Minister of State Babul Supriyo presented the award to a Jaipur Metro team, led by chairman and managing director Nihal Chand Goel, at a ceremony in New Delhi on Friday, 27 November. The irony is that Raje has been a staunch critic of the project, initiated by her predecessor, Congress's Ashok Gehlot, in 2010. In fact, in the run-up to the 2013 state assembly elections, and also after coming to power, Raje came down on Gehlot's two pet projects - the Jaipur Metro and the Barmer refinery. She had even questioned the 'economic wisdom' of Gehlot. Jaipur is India's sixth metro rail system. It is also said to be one of the fastest-built metro systems in India. After receiving the award, Goel emphasised: "As the project was completed in four years and a quarter, the Jaipur Metro is one of the fastest implemented projects in the Metro sector." The land acquisition process for the project also took place smoothly. The empowered settlement committee set up for the purpose worked out mutually-agreed rehabilitation packages, and those affected were settled accordingly, Goel pointed out. Also, the fact that there were no cost overruns also made Jaipur Metro one of the most successful projects. The first phase, which became operational in June this year, has several innovative features. All the stations are supported by a single row of piers, to make the overall structure lighter and more open. A rain-water harvesting system has also been built into the design, making the entire length of the viaduct its catchment. Raje, who holds the finance portfolio, had said while presenting her first budget that the Barmer refinery and the Jaipur Metro couldn't be called "good financial decisions". In the case of the refinery, the Gehlot government had signed a memorandum of understanding with the public sector Hindustan Petroleum Corporation Limited (HPCL) for Rs 37,230 crore in 2013. Raje decided to "renegotiate" the terms and conditions with HPCL. In the case of the Jaipur Metro Rail Corporation (JMRC), the Gehlot government started work on the 11 km-long Phase-1A with an investment of Rs 3,400 crore. Raje had said: "With this much money, 110 kilometres of over-bridges, or 5,000 kilometres of roads could've been constructed." She had also pointed out that the state would have to incur an annual loss between Rs 60-80 crore, which was equivalent to a 30-40 km long rural road. She alleged that even the trains were purchased in haste - commercial operations on the Chandpole-Badi Chaupar extension of the Pink Line are supposed to start later this year, but the government had bought two trains for Rs 100 crore in 2012 itself. "Now these trains would gather rust for the next three and a half years," she underlined. Moreover, "the metro line has spoilt the skyline of the city - a tourist destination," she had maintained. Her words had given rise to speculation about the fate of the two projects. But Raje knew well she couldn't turn back the clock. This, however, didn't stop the Congress from organising public protests, accusing her of planning to scuttle various welfare schemes and infrastructural projects. Raje's reaction was to keep a provision of Rs 402 crore for the refinery project for the financial year 2014-15, far more than Rs 26 crore provided by the Gehlot government. Similarly, a provision of Rs 486 crore was earmarked for the metro project for the last financial year. The difference was that Raje wanted a Public Private Partnership (PPP) model to be implemented for phase-II of the metro, which is yet to be realised. Eight companies from Singapore, US, Korea, China and Malaysia failed to find the project financially viable. Phase-II, which is scheduled for completion in 2021, will be 23 km long and will have 20 stations. It will connect Sitapura Industrial Area in the south to Ambabari in the north via Ajmeri Gate and Mirza Ismail Road. The tracks will be elevated between Sitapura and Ajmeri Gate and then underground. The financial cost of this phase is estimated at around Rs 100 billion (US$ 1.57 billion). It is expected that the state government would provide 40% as viability gap funding to the preferred bidder, while the remaining 60% would be shared between the state government and the selected firm. Raje initially insisted on a 50% share in the project from the Central government, but has now accepted a 20% share. The Gehlot government had also agreed to 20%, but she was not happy with it. After the Modi government came to power, the Raje government entered into a memorandum of understanding (MoU) with the Asian Development Bank (ADB) for a loan of $176 million (Rs 969 crore), for the metro project's Phase-I (b). The MoU was signed in New Delhi. The signatories to the loan agreement were Nilaya Mitash, Joint Secretary (Multilateral Institutions), department of economic affairs, Union Ministry of Finance, on behalf to the Government of India, and Teresa Kho, country director for India, on behalf of the ADB. The project agreement was signed by DB Gupta, Rajasthan's principal secretary (urban development and housing) and Goel as CMD, JMRC. Interestingly, when the JMRC had sought a loan for Phase-I, the ADB had refused to provide the loan, as the project had already started. Bank norms don't allow it to fund any project halfway. However, following the state government's persuasion, the bank agreed to fund Phase-I(b), said a JMRC official. For Raje, it's an odd situation to be in. Despite having so many objections to it, she kept the metro project going and, in fact, strengthened it. And now the Centre has awarded it the tag of best in the country. She can't even fume publicly about it, even if she wants to.